Crestline Village is noted for the fun and friendly walkable downtown area with dog walkers, strollers and joggers filling the sidewalks. Crestline was incorporated into Mountain Brook in 1942 but has maintained that small town look and feel. 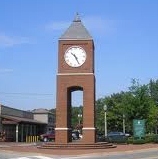 The Clock Tower is one of Crestline's most notorious landmarks. If you are thinking about buying in the Crestline area or selling your Crestline home, give Bonnie Hicks Re/Max AL a call at 205-915-7653.